Are you planning an unusual biking holiday? 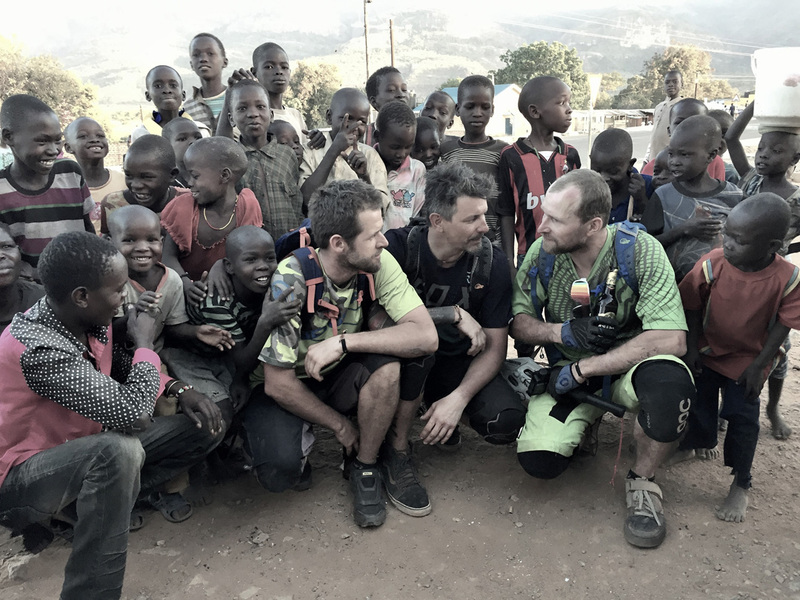 Get inspired by Adam, Peter, and “Panky” from the Czech Republic who visited Uganda for three weeks and came back totally amazed. Adam: Originally, it was Panky’s idea. One day, he simply asked me, if I wanted to join him for a bike trip to Uganda. And I plainly said yes. This was the beginning. Once the decision has been made, we started collecting all available information. First of all, we wanted to learn about safety. While completing one of our job tasks, we met our friend Peter “No Control” who got also interested and joined the team. How long did you prepare for the trip? It took us at least six months. In the beginning, we were just discussing all possible circumstances. We had two main options in mind – whether to rent a car and move from one site to another this way or to arrange the adventure like a true bike trip with carrying all the packs and bags on the bicycles. In the end, we have decided for the second option. Shortly after that, we realized how big of a challenge it will be to pick only the most important stuff as we naturally needed food, tools, cameras, sleeping bags, tent, clothing… Way too many things. After two days in Uganda, we just changed our minds and rented a van. It was a really old Toyota Hiace Super Custom with the history of 546,872 km made. While driving, you couldn’t let go of the driving wheel even for a second because once you’d do that, the car would have ended in a ditch right away. On the other hand, the car proved to be indestructible. Land Run 100: Is There a Muddier Race Than This One? What else did you bring to Africa with you? We picked everything that made sense to take with us including medicine, first-aid kit, spare parts, insect repellent, three flasks with spirits, digital camera, dried food, waterproof ultra-light jackets, chargers, solar charger, power banks, miles of cables…. After we arrived in Uganda, we found that half of the equipment was easy to buy in local stores. Heat and humidity. 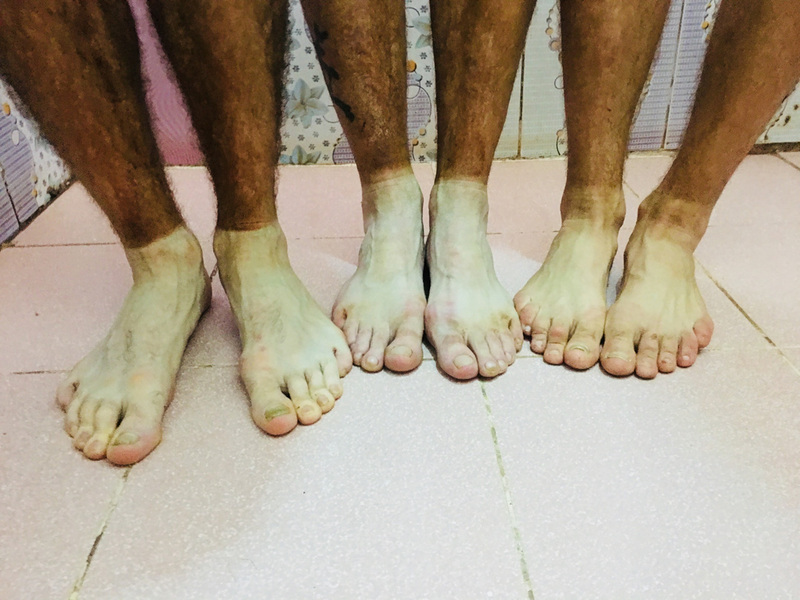 At about 4 AM, we disembarked the plane in Entebbe and the first thing that came to my mind was there’s no way to ride the bike under these conditions. I felt like sitting in a sauna trying to breathe through a wet rag right over my mouth. Luckily, the weather has changed and everything turned to be alright. We intended to deliver five bikes for kids of the Jan Nepomucky school founded and built by the Czech foundation Charitas. After we handed the bikes over to the kids, we left for a trip. Have you experienced any inconvenience? Everything was fine except the fact that in Uganda, nobody was selling chilled beer from the fridge. And even if the beer was stored in the fridge, the fridge was not plugged in. Did you manage to avoid accidents? The biggest problem we encountered was when I ruined my shoe after a hard landing from a drop. Luckily, I braced the inner part of the bike shoe with a beer opener. The solution worked well and the shoe failed to hold in one piece three days before our flight back home. Apart from ripping the chain, we didn’t meet any other troubles. Did you meet any dangerous animals? We were instructed about the beasts, spiders, and snakes living wild in Uganda but we saw none even though we spent a night in the jungle. We took enduro MTB bikes made by Giant and Trek, which proved to be the right choice. 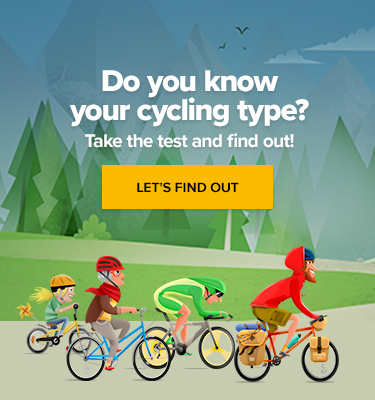 How is the local bike scene? 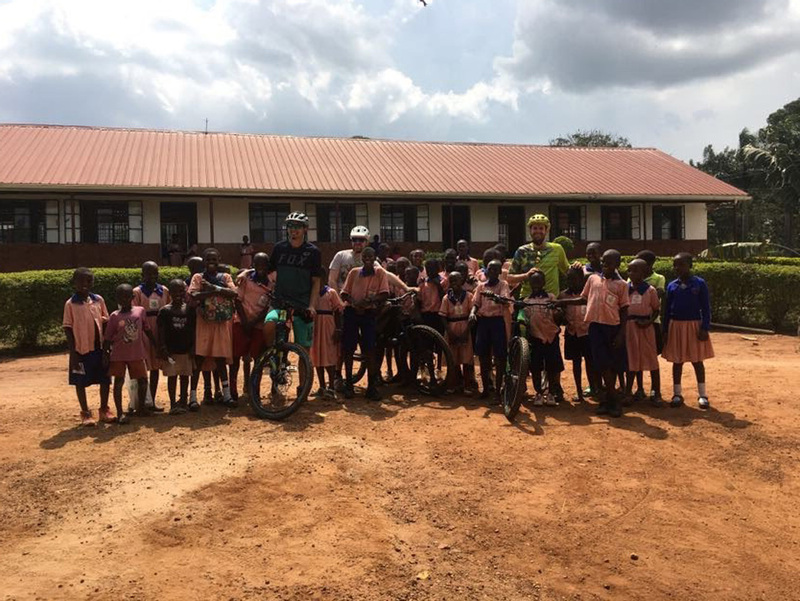 We were like a hilarious attraction for the locals as there are no mountain bikers in Uganda, just us. All the trails we rode are only being used by pedestrians. 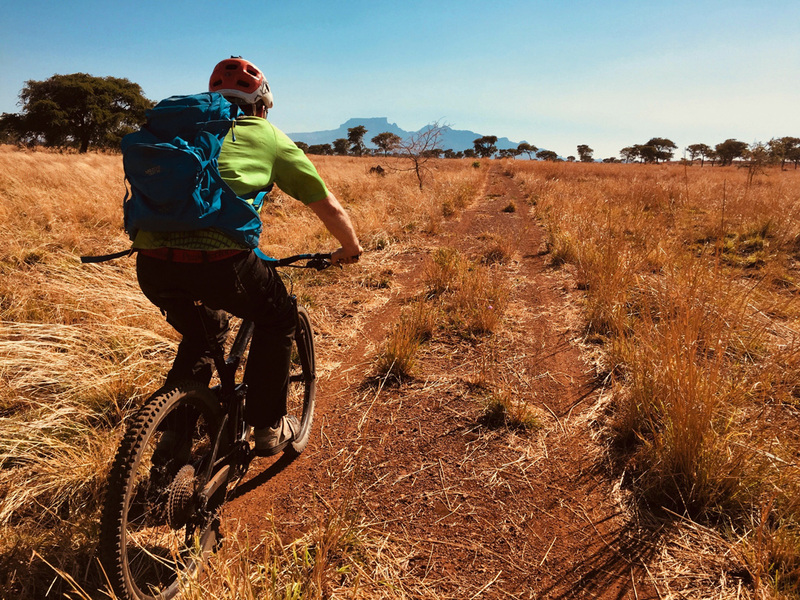 The only guy with a bike was Will – the owner of the campsite close to the volcano Mt. Elgon. He had a nice GT Force bike and have been riding it for ten years. Other people were amused seeing us on the bikes calling us “muzungo” which means white. Mainly kids were extremely entertained and tagged along for long passages. How did your typical day look like? We had pineapples, bananas, and coffee for breakfast. The food for lunch we bought in local take-away followed by a beer and for dinner was served beer, coffee, and beer. Mostly we ate rice, Matoke – mashed bananas or Posho – mashed corns, Chapatu bread, and local meat soups. We also liked Tilape – mutton chunks grilled on a stick. Apart from that, we enjoyed a lot of delicious fruit of any kinds. In between, we cycled or planned where to cycle the other day. Wasn’t it dangerous? How was the traffic? In big cities like Ninjas or Kampala, there’s always a traffic jam. Whenever you drive a car, you always get stuck. They drive on the left-hand side of the road and most of the roads are extremely dusty. We were aware of the theft problem but no such thing happened. 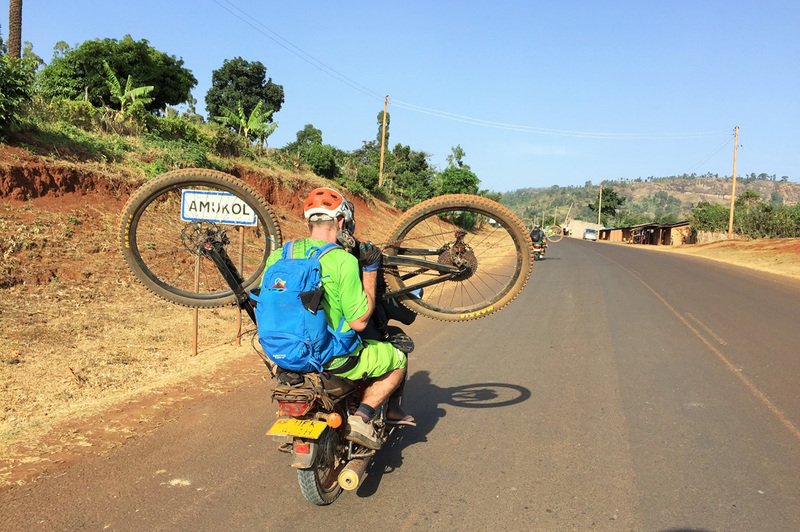 Would you recommend Uganda as a bike trip destination to us? 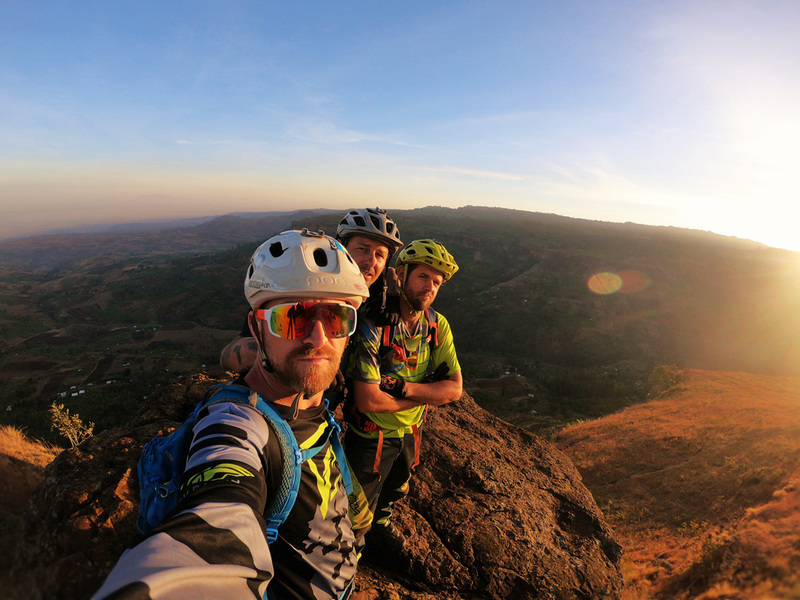 Anyone enjoying countries with great mountain biking trails and a beautiful landscape would be utterly amazed. We fell in love with Uganda instantly on the first day of our visit. Best MTBs of 2018: Fancy Buying a New Bike?